Mideast church leaders meeting in Jordan developed a two-pronged action plan to help Catholic families. Secondly, he said the church sought to “create counseling offices in order to avoid couples immediately going to the courts” to deal with family problems that might arise. In many Arab countries, where Islam and Islamic law predominate, there are no civil laws regarding marriage and divorce. That means that the state relies on religious bodies such as Catholic family law courts to certify marriages. Often, civil divorce is impossible for Catholics in the Middle East, with many resorting to leaving the faith — becoming Orthodox or even Muslim — in order to find a tribunal that will allow them to escape their marriage. With the Year of Mercy that began in late 2015, the church streamlined procedures for annulment cases, which have become a matter of urgency in many societies in the Middle East. Archbishop Pizzaballa spoke to Catholic News Service 23 July after the conference’s closing Mass at Martyrs of Jordan Church. Delegations of clerics, judges and lawyers specializing in canon law from Iraq, Lebanon, Syria, Egypt, the Palestinian territories, Israel and Jordan participated in conference, which discussed a number of legal issues relating to marriage and the family. The proceedings were chaired by Father Emil Salayta, president of the church court in Jerusalem. He said the main purpose of the conference was to help priests and lawyers who work in courts understand new regulations following Pope Francis’ September document bringing the basic legal instruments that govern the Latin- and Eastern-rite Catholic churches more closely into accord on several issues involving baptism and marriage. “The decision has just been taken. Now we need to sit down with the pastoral offices, people, and other concerned offices to see what to do in order to build this,” Archbishop Pizzaballa said. “We cannot expect in one year to have everything ready, but to build it. We are aware of the problem and we have to find not-easy solutions,” he said. Archbishop Pizzaballa said today’s youth often have a “completely different mentality” about commitment, and preparations are needed to help them to make lasting ones. “In the past, the youth used to ask: ‘Why do this?’ Now they ask ‘Why not?’” he said. The papal nuncio to Jordan and Iraq, Archbishop Alberto Ortega Martin, stressed that “Amoris Laetitia,” Pope Francis’ 2016 apostolic exhortation after two synods of bishops on the family, shows the importance of compassion that should be exercised by the church, especially on the subject of families. He told conference participants that the Catholic courts should serve the law, demonstrate compassion and love through their judges and lawyers, and be witnesses to the greatness of marriage. Israeli security forces arrest a Palestinian man following clashes outside Jerusalem’s Old City on 21 July. Pope Francis has appealed for dialogue after a surge of violence in the area. The overwhelming need for those who are still considering returning home is the need for security at several levels. They seek assurances of a national government that guarantees them protection and their basic human and religious rights; they also seek local governance that will provide basic services; and they especially want freedom to maintain their faith and to worship as they please. The insecurities are deep and the trust is lacking, so many have decided to wait and see before they make their final decision to return or to move on, whatever that might mean. Despite the uncertainties and all the misery that accompanies those who are displaced, they find in the church a source of comfort and hope. Through Christ’s sacramental presence in the Eucharist and in many good works of charity and mercy, the church represents for them a beacon of the light of Christ and a reason to endure. Nothing is certain for the refugees, except the love of God for all, especially as Jesus has shared with them on the cross. Read more and see more pictures as this link. Editor’s note: this week, we launch a new feature on our blog, “CNEWA Connections” — weekly posts that we hope will provide background and context to some of the stories unfolding in CNEWA’s world. The Iraq city of Mosul has been in the news quite a bit lately and has been freed from the control of ISIS. It may, however, prove to be a Pyrrhic victory, since much of the city now lays in ruins. While the world watches in sorrow the stories and images coming out of Mosul, and witnesses the humanitarian nightmare its destruction has created, it’s worth taking a moment to put the place in context. This city, the largest that ISIS tried to conquer, has a long history. Mosul (Arabic al-Maw?il, “the connection, confluence, depot”) originally on the west bank now lies on both sides of the Tigris River. It is not a very ancient city, although it is close to the ruins of Niniveh, the capital of the very powerful Assyrian Empire which was destroyed by the Chaldeans of Babylon at the close of the 7th century BC. The position of Mosul made it an ideal center for trade between China and India via the Silk Roads to the east, to the Greek and Roman Empires to the west and Arabia and Africa to the south. In pre-Muslims times, Mosul was a metropolitan see (archdiocese) of the Church of the East and was second to Ctesiphon — and later Baghdad — where the Catholicos/Patriarch resided. It was conquered by Muslim armies in the 7th century AD and later became part of the Abbasid Caliphate. As would be expected for a city on the juncture of several trade routes, Mosul was very cosmopolitan. Originally a Christian city, over the centuries it became increasingly Sunni Muslim. Nevertheless, there was a considerable Christian minority consisting of Christians of the Assyrian tradition (Church of the East and later also Chaldeans) and other Christian churches, Jews, Shi’ites and others. Ethnically, the majority of the population of Mosul was and remains Arab, although there were a good number of Kurds in the city. Many Christians in the region consider themselves Assyrian and not Arab. As might be expected, instances of sectarian conflict in Mosul were recorded over the centuries. Mosul is the main city of the Nineveh Plain which has been home to a large Christian population spread over several small cities and villages. The Christian population of the Nineveh Plain is an ancient one, tracing its roots back in some instances to the 4th century AD. Historians recount that Mosul was famous for its textiles and the English word, muslin, a type of fabric, is derived from the name Mosul. Mosul and its environs were home to several pilgrim sites. Perhaps the most famous of these was the shrine of Nabi Yunas, the prophet Jonah — who, according to the Old Testament, had preached repentance to the Assyrians in nearby Nineveh and was buried at the site. In this image from 1999, Iraqis visit the shrine of Nabi Yunas, the prophet Jonah. Originally a Christian shrine, it became a mosque as the Christian population diminished over the centuries. The al-Nuri Grand Mosque was built in the 12th century and underwent several renovations over the years. A huge structure, it was famous for its minaret, from which the Muslim call to prayer is broadcast. The minaret leaned at an angle similar to Italy’s famous Leaning Tower of Pisa. Under the Ottoman Empire, modern day Iraq, was (wisely) divided into three vilayets or provinces: Bosra for the Arab Shi’ites in the southern third of the country; Baghdad for the Arab Sunnis in the center of the country; and Mosul for the Kurdish Muslims in the northern third of the country. After the Sykes-Picot Agreement of 1917, the French and British united all three vilayets to form the new country of Iraq. After several revolutions, Iraq evolved into one very diverse country held together by a strong man, Saddam Hussein. Kurdish revolts in the north and Shi’ite revolts in the south were common and were met with incredible brutality by the Hussein government. After the fall of Saddam Hussein, Iraq began to become unglued. Centrifugal forces surfaced and the old Ottoman vilayets provided the fault lines which continue to divide the country. In that vacuum arose first al-Qaida in Iraq under Abu Musab al-Zarqawi, a brutal terrorist. After Zarqawi’s death al-Qaida in Iraq went underground and metastasized to what would become known as the Islamic State of Iraq and Syria (ISIS), also known as the Islamic State of Iraq and the Levant (ISIS) and by its Arabic acronym da’ish. With incredible speed in 2014, ISIS attacked Mosul. The large Iraqi army fled when faced with an almost minuscule ISIS force and Mosul became part of ISIS. In June 2014 in the al-Nuri Grand Mosque in Mosul Abu Bakr al-Baghdadi (whose name has changed several times, each time giving him a more noble pedigree) declared himself Caliph. ISIS was now on the world stage with a vengeance. Although Raqqa in Syria was the purported capital of the caliphate, Mosul was in some ways more important. ISIS plundered the many resources which Mosul had to offer — military equipment left behind by the fleeing Iraqi army, many banks whose funds were stolen, and a population estimated at 1.8 million, half of which fled, leaving behind properties, money, etc., which was confiscated by ISIS. ISIS was driven from Mosul in the spring and summer of 2017 by a coalition of Iraqi troops, Kurdish militias and American advisors. The loss of Mosul was a serious loss for ISIS but perhaps a greater loss for the people of Mosul and the Christians who had fled from the Plain of Nineveh. Arial photographs show the city to be leveled. The retreating ISIS forces used explosives to destroy the Shrine of Jonah and the al-Nuri mosque. Christians who fled to Irbil in Kurdish Iraq wait and wonder if the Niniveh Plain will ever again be safe enough for them to return. It is a sad irony that for centuries Mosul lay just across the Tigris River from the ruins of ancient Niniveh — ruins which Mosul itself now resembles. Men carry the casket of Israeli policeman Hail Sethawi 14 July who was killed in an attack at the Temple Mount compound in the Old City of Jerusalem. The heads of Jerusalem’s Christian churches have expressed “serious concern” over rising tensions and violence in the Old City. The heads of Jerusalem’s Christian churches expressed “serious concern” over an escalation in tensions in Jerusalem’s Old City as hostilities remained high following the mid-July shooting deaths of two Israeli policemen and three gunmen on the Al-Aqsa mosque compound. Archbishop Pierbattista Pizzaballa, apostolic administrator of the Latin Patriarchate of Jerusalem, and Franciscan Father Francesco Patton, custos of the Holy Land, were among the signatories of the 19 July statement. Police believe the gunmen — three cousins, Arab citizens of Israel who were killed by Israel police — stashed their weapons inside the compound of the holy site for use in the 14 July attack. Jerusalem Muslim leaders have called on worshipers not to go through the metal detectors, and Muslims have been converging outside the Old City’s Lion’s Gate for prayers instead. We were delighted to get a visit Wednesday from a longtime friend in Georgia, Anahit Mkhoyan. Her name may ring a bell. 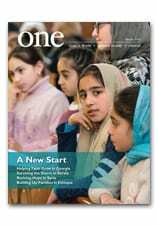 She is director of Caritas Georgia, and wrote A Letter From Georgia in the Winter 2016 edition of ONE — a deeply personal and moving essay that was honored last month at the Catholic Press Awards in Quebec. We were pleased to present Anahit with her award certificate and hear her thoughts about the important work she is doing in Georgia. She spoke, in particular, of her gratitude for CNEWA’s support of the organization’s mother and child center — and the boundless generosity of CNEWA’s donors. The impact of CNEWA’s donors, she explained, is dramatic. Thank you, Anahit, for that message — and for being such a generous collaborator in CNEWA’s work! The book is also “a testimonial” to the victims of “the Islamic terrorism of ISIS,” he told the Christians and non-Christians he met when Pope Francis sent him as his personal representative to encounter and pray with these shaken communities that fled the Islamic State. That brief visit in 2014 was a homecoming of sorts. The Italian cardinal, now 71, lived in Iraq during a time of great tension and turmoil. St. John Paul II made him the apostolic nuncio — the pope’s diplomatic representative — to Iraq and Jordan in January 2001. Several months later, after 9/11, the United States administration started building pressure against Iraq, pushing for military action. St. John Paul firmly opposed military intervention and, despite the fact that he sent peace-seeking missions to Washington and Baghdad, the United States attacked. The nunciature never shut down, not even during the airstrikes and occupation or the ensuing chaos of looting and revenge. It was during his tenure there in Baghdad, which ended in 2006, that Cardinal Filoni went through the nunciature’s archives, which housed “a rich history” of documentation and letters, detailing the history of the Vatican’s diplomatic relations with Iraq and the establishment of an episcopal see in Baghdad in the 16th century. “Naturally, this caught my eye,” he said, and the idea for a book emerged there in the wealth of material buried in an archive. The book’s chapters take a historical overview of the church’s long presence in Mesopotamia, dating back to the time of St. Thomas the Apostle, and looks at how the expanding early Christian communities there evolved, faced internal divisions and challenges, and still shared their unique gifts. Published first in Italian in 2015, The Catholic University of America Press is releasing the English edition toward the end of July in the United States and in mid-August in the United Kingdom. The cardinal spoke to Catholic News Service in Rome during an interview at the Congregation for the Evangelization of Peoples, where he has served as prefect since 2011. The book looks particularly at how minorities and the country as a whole suffered invasions, despots and Western hegemony, and yet tenaciously held on to its cultures and religious identities. “In order to defend their identity within this great sea of Islam, Christians had to withdraw into themselves, keeping their own language, which dates back to the time of Jesus, that is, Aramaic,” he said. While, over the centuries, the everyday spoken language developed into different dialects, the liturgy still maintained the original form of ancient Aramaic, he added. Even though Christians held on to their traditions and culture, they were “truly open” and didn’t ignore the world around them, learning and speaking Arabic, for example, he said. This kind of everyday contact between Christians and their Muslim neighbors also led to a sharing of ideas, influence and mutual respect on the local level, Cardinal Filoni said. For example, he recalled when he lived in Baghdad, he visited a church dedicated to Mary in a predominantly Muslim neighborhood. “I was astounded by the fact that the walls of this church were dirty” with what looked like handprints smudged everywhere, he said. Since Mary is revered by Muslims, he said many expectant mothers visit this church to pray to her for protection. “This influence, for example of Mary, in people’s daily lives” and similar devotions to prayer, fasting and charity, fostered closer relationships, mutual respect and understanding between Christians and Muslims, he said. “A modern Iraq, full of history, of possibility and responsibility — not least because of its huge oil resources, which continue to be a source of discord, jealousy, envy, and oppression — should be defended, helped, and supported more than ever,” the cardinal concludes in his book. While the primary responsibility for allowing Muslim, Christian and other minorities to return to their country and help build its future belongs to Iraq’s three largest communities — Shi’ites, Sunnis and Kurds — the rest of the world is also “in some way responsible for this crisis,” he told CNS.